“Exploration” is the word for this trail-blazing couple. 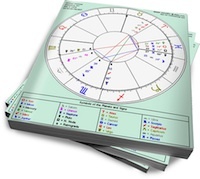 Sun in Sag’s sense of adventure will be supported by Moon in Aquarius’ need for something different. However, Aquarius’ detachment will come in handy when Sag gets carried away with his big ideas. Sun in Sagittarius wants to keep moving forward. He always sees more on the horizon, and his sense of possibility makes him an encouraging partner. He does best with a lover who is at least open to new experiences; a conservative partner who sticks to the rules will be suffocating for him. However, due to his sense of limitless possibility, he does have a tendency to take on too much, or push things to the extreme. Sun in Sagittarius can become enamoured with his own ideals (and lose touch with reality). Therefore, a partner who is able to step back from his rush of enthusiasm would help balance him out. Moon in Aquarius needs a relationship on her own terms. This means partnering with someone who gives her space and understanding. She can be stable (even stubborn) but that stability is rooted in detachment. Moon in Aquarius will always be slightly “outside” her emotions; she has the unique ability to stand back and observe what she’s feeling, rather than drowning in the moment. For this reason, a lover who is secure enough to not take it personally that she isn’t ultra-cuddly or demonstrative is best. Sun in Sagittarius will be given free rein by his Aquarius partner; she’ll be content to accompany him on his adventures, or go off and do her own thing. Sag will be laid back enough to be happy with either of her responses. Moon in Aquarius’ core detachment will come in handy when Sagittarius loses himself in one of his quests; she may not pull him back to earth, but her cool response will be enough to sober him up. If she feels like it, she may offer an observation that puts it all in perspective. What if I am a sun sag 6th aquarius moon 9th? A little bit of both?